Santiago F. Lampón is a lawyer and a notary who has been practicing in Puerto Rico for over 20 years. 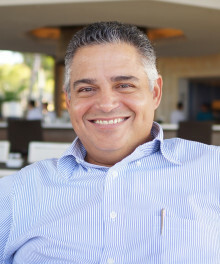 He is the founder and principal of Lampón & Associates, a real estate Law Firm in Puerto Rico. Mr. Lampón is also the author of a series of publications which explain basic tenets of Puerto Rico Law for non-lawyers. His first book was published in late 2009. His most prolific expositions are found through his videos and articles dealing with Real Estate properties in Puerto Rico and their relationship with Puerto Rico Inheritance Laws. Most of his articles, videos and comments on legal issues pertaining Puerto Rico, are available free on the Internet. Mr. Lampón’s practice has involved him in matters throughout the world, including Canada, England, Italy, and Spain, and also across the United States and the U.S. Virgin Islands, both for international transactions and litigations related to real estate and businesses issues connected to Puerto Rico. Besides being admitted to practice in Puerto Rico, both State and Federal Courts, Mr. Lampón is also admitted to the United States Court of Federal Claims in Washington D.C.
On a personal level, Mr. Lampón is actively helping families and children across Puerto Rico. He spends most of his free time assisting groups like The Way to Happiness Foundation, Youth for Human Rights International and The Drug Free World Foundation. Through his personal experience as a father, he has learned that there is no greater pleasure than the one resulting from helping others, particularly children, and empowering them with the knowledge that will help create a brighter and better future for all. Mr. Lampón has been married for 22 years to Esthela González, and enjoys the blessing of a son who is an excellent painter, an exceptional tennis player and a friend.